Jo Taylor at Lena Boyle Fine Art, 9th – 18th June 2010. 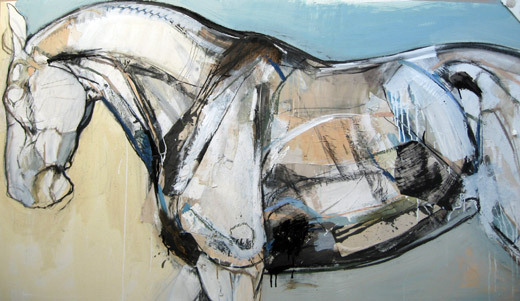 A collection of new works will be exhibited at Lena Boyle Fine Art from 9th – 18th June 2010 In this body of work Jo Taylor explores the horse from her studies with the Thoroughbred In Ireland. Please contact the gallery for further details. After the success of the War Horse screen-print, Jo Taylor will once again be collaborating with master print-maker Kip Gresham at the Pnnt Studio, Cambridge to produce a limited edition of screen-prints. Please contact Jo for further details and pre-orders. Jo Taylor will be represented by Greg Ladd of Cross Gate Gallery at Saratoga Springs, New York during the Festival of Racing. A limited selection of mixed media works will be available. Progress has been made with the ongoing Eclipse commisslon. Jo Taylor has been commissioned to trace tile origins of the English Thoroughbred from Eclipse through to modern day She has worked with three of her selected stallions – New Approach at Dalham Hall Stud In Newmarket and Galileo at Coolmore Stud in Ireland. She recently visited the Royal Veterinary College in Hatfield to draw the bones of the most influential stallion, Eclipse – a horse which George Stubbs used as a model She IS due to see St Simon at the Natural History Museum shortly An update will follow. Jo Taylor is working on a series of new drawings for the University of Liverpool. She is has returned to work during surgery at the Equine Hospital at Leahurst. The results can be seen on the gallery page in due course. 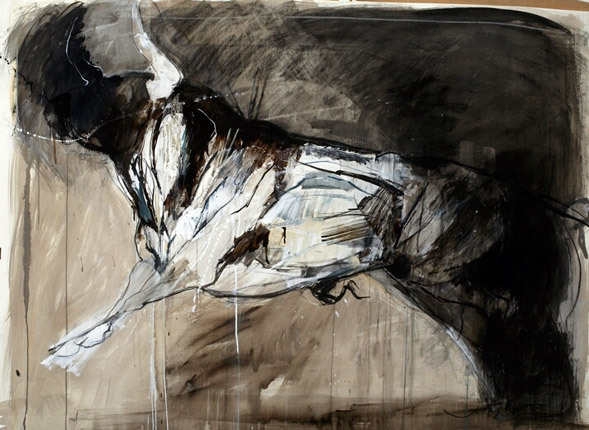 During the summer, Jo Taylor returned to the Bulls at Beziers in preparation for new paintings, drawings and prints for 2011. 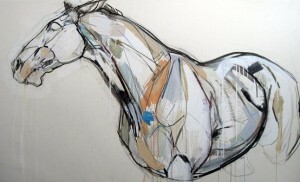 In early October, Jo Taylor will be showing recent paintings. drawings and prints With McMaster Tims Contemporary Art at The Air Gallery on Dover Street A number of works will be available for viewing at the Dorset Gallery prior to the London exhibition Please contact McMaster Tims for further Information. Work has been completed to the proofing stage with the new 6 colour screen-print which is due to be editioned at the end of October. It will be available for purchase in early November. Jo Taylor will be showing new paintings with Lena Boyle Fine Art at the London Art Fair 19 – 23 January 2011 at the Business Design Centre in Islington.